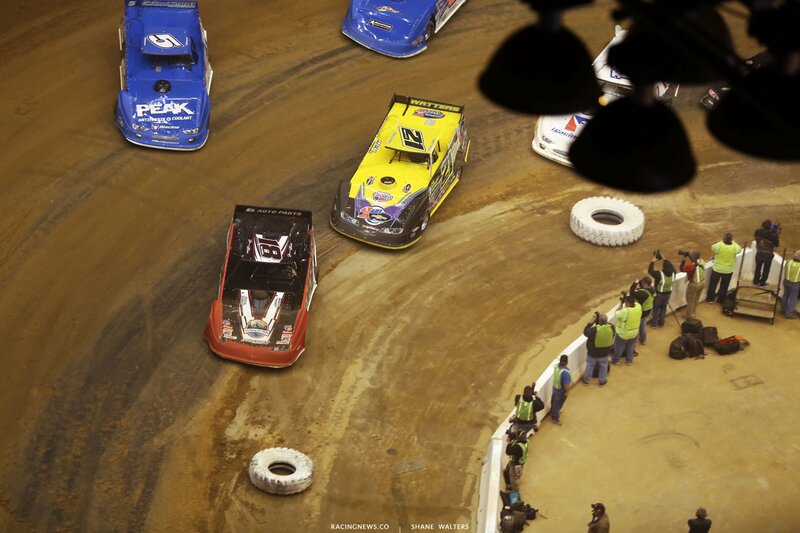 The Race of Champions is a new addition to the Gateway Dirt Nationals format. It features a 20 lap shootout on the 1/5 mile bullring. The starting lineup is set by draw. Following group qualifying, the twelve Race of Champions drivers were sent to the infield to draw for their position in tonights main event. The track is already running a little differently in comparison to last year. The groove was pushed up a bit in hot laps. Is was about 50/50 for drivers running the top or the bottom. Just ahead of tonights main event, they are doing a little work on the track. The bottom lane turned a little black. Track workers are spending time at the top part of the race track. A little water and a little packing. We’re going green. 20 laps around this 1/5 mile bullring. Don O’Neal and Billy Moyer will lead the field into turn 1. Green flag, Shannon Babb wins the race into turn 1. 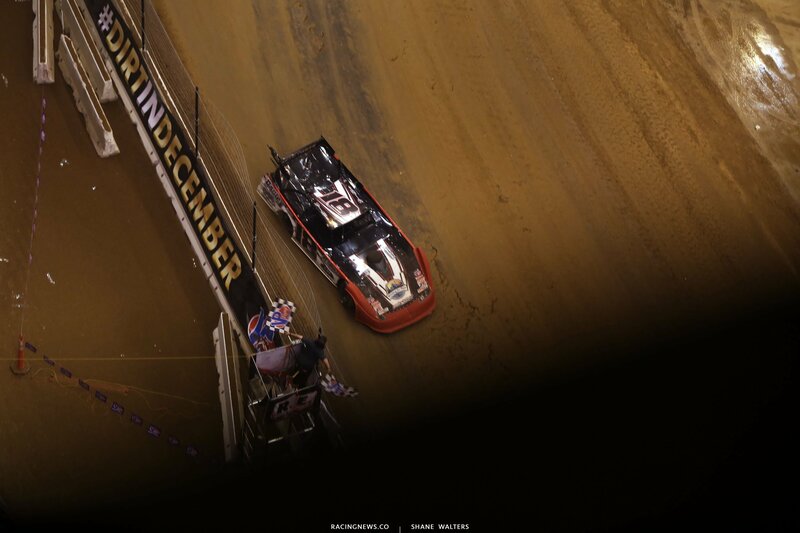 Billy Moyer is inches from his rear bumper. Most cars are running the bottom. Their dipping their left front onto the concrete in the corners. This year, there’s a drop off from dirt to concrete. 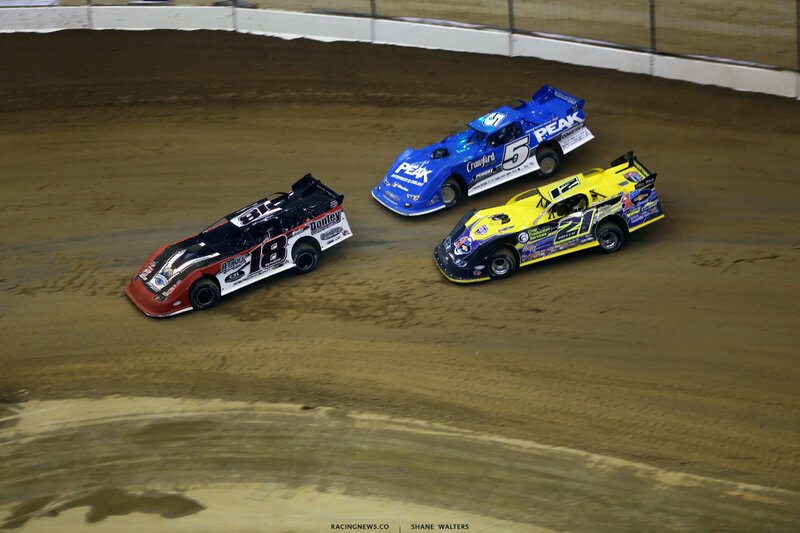 Scott Bloomquist and Bobby Pierce are the only ones attempting to make the top groove work. 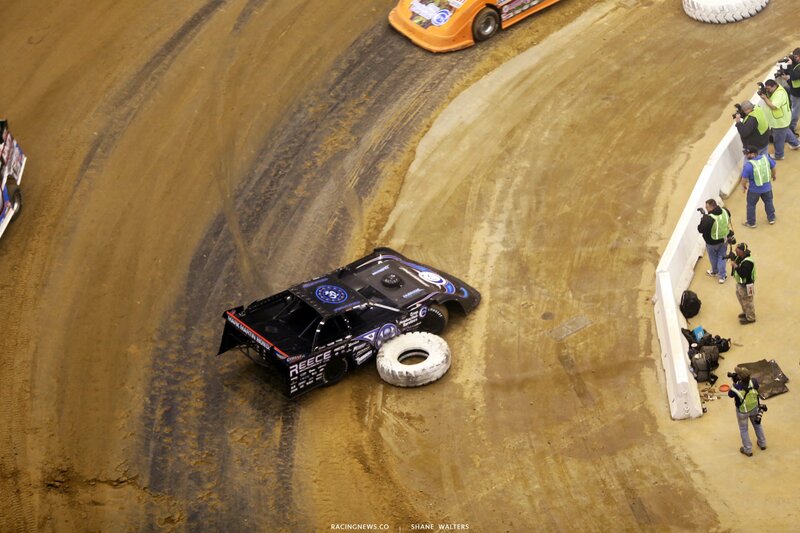 Bloomquist is trying to get the power down and move around Dennis Erb Jr.
Bloomquist spins! He looped it off turn 4. No contact, he just got on the gas, trying to move even with Erb. Bloomquist spun to the inside tire barrier. He re-fires but pulls off. Green flag, Shannon Babb holds the lead in turn 1. But, the race is on for 2nd. Don O’Neal and Billy Moyer Jr run side by side through turns 1 and 2. They do it again in 3 and 4. Don O’Neal completes the pass on the highside in turn 3. Don O’Neal sets his sights on Shannon Babb. He’s quicker but he can’t find a lane. 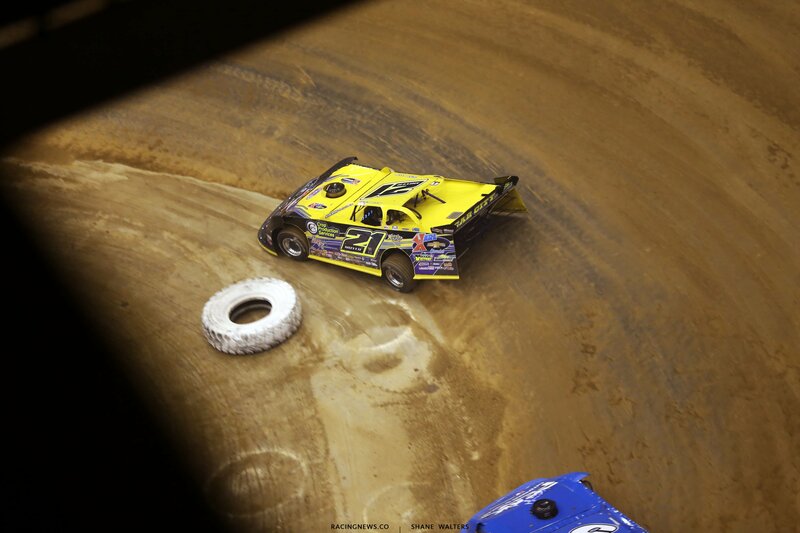 As Shannon Babb hits the brakes and dives to the bottom, O’Neal has to lift and wait for him to turn. As soon as he does, O’Neal is on the gas, at the entry. Babb has knocked off the right side of the rear spoiler. He used a little too much race track on the exit of the corner. Don O’Neal slips, Moyer pulls to the inside but can’t complete the pass. 1 to go and Shannon Babb has opened up a 5 car length lead after O’Neal’s mistake. Shannon Babb wins the 2017 Race of Champions at the Gateway Dirt Nationals in St. Louis. Babb will be rewarded with a check for $5,000.